Not the best start of the day. The power went out early in the morning in the whole city, meaning no aircon in the dorm. Damn, that got sweaty. Now I’m back again at 9am. Please gods, karma monsters and other supernatural forces, give me some good stuff now! Okay crap, I couldn’t have my card, and I had to contact my Swedish bank to block it, and have a new one sent to me. I’ll figure out a good address for it, probably to a new friend in Belize. Meanwhile, this blog will now be about how to survive without a credit/debit card! To make the most of the day before continuing my journey tomorrow, I went to the Tulum ruins. Fewer people today (I arrived much earlier, around 10), entrance ticket is 80 pesos without a guide, but me and a friend ended up with a guide for 170 instead. Definitely worth it, because I learnt a lot about the natives, Mayans especially, who built the city around 1200, and their fascination with astronomy. The ruins themselves were honestly nothing special. A pretty big lighthouse was the highlight, but there was nothing like the temples that can be found elsewhere in Mexico. The tour was 40 minutes and then we could walk freely. We felt like we had already seen it all, so we biked to the beach. Three old locals, a man and two women, were sitting in the shade as we biked the last bit on the sand to reach the beach. They were super nice, asked about my trip, offered a beer, and promised to keep an eye on the bike while we cooled down in the sea. I hesitated, saying it was against the rules, but they kept insisting and encouraging me until I finally gave in and took a quick shower after all. Despite being a touristic village, there are definitely cheap places to eat. Tacos can be found everywhere, for 12-15 pesos each. They’re smaller than we’re used to though, always soft corn tortillas, and usually only have a few ingredients each. 3 are enough to get full! Home-made horchata (rice drink with almond and cinnamon) or simple fruit juices can be bought for around 15 pesos each. Tamales don taco has tamales for 15 each, and can come with chaya (the Mayan spinach), chicken, beans, eggs and/or many other things. Very soft and unusual, but tasty! Las Quekas is a simple eatery with soups for 15 pesos and quesadillas (tacos but slightly bigger and cheese, but no vegetables) for 13 pesos each. If you want to spend a little more, this is one of the vegetarian restaurants in Tulum. They have a large amount of freshly made juices (choose 3 ingredients among things like pineapple, carrot, celery, orange, cucumber, and a lot more for 35 pesos, which is not super cheap, but certainly less than half of what you’d pay in Scandinavia), and today I tried their Nopalina salad, which ended up being another personal favorite, with vegetables and a warm tomato mix, surrounded by nacho chips. A good lighter lunch! Tomorrow I’m biking to Felipe Carrillo Puerto! Pro-tip: Drinking too much alcohol the night before a demanding bike trip is not recommended. I knew that today would be a long day. 96 km is a big step up from the 64 km I biked on my first day on the road, so I decided to start early and split the trip in three. Most exciting thing on this route: A bump made my bag of nuts fall out of the basket, and I had to walk back and pick it up. This is the type of ruins I had hoped for! 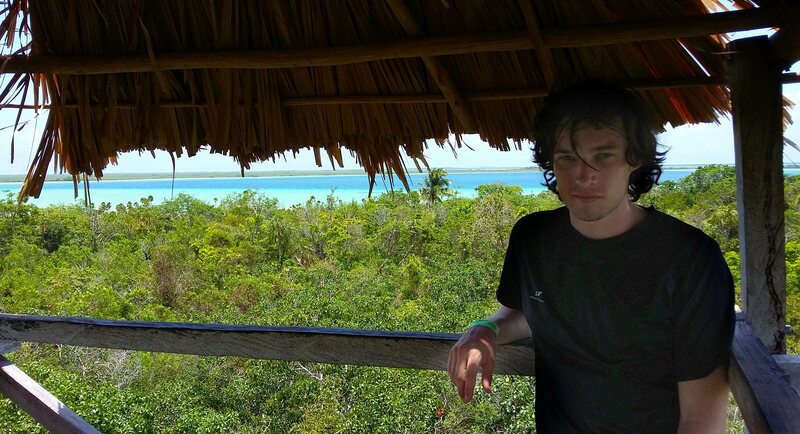 I can believe so many people go to the Tulum ruins and pay more, when it’s so much less interesting. Seems to still be worked on though, as people were still digging, and it was quite badly signed. What’s in this cave for example?! No sign told me. 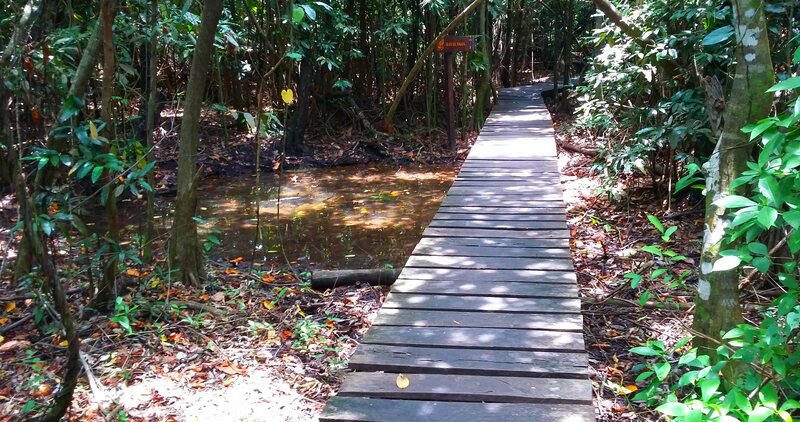 For 50 extra, you can take a short jungle hike to a lagoon, and it’s cool if you like walking in the jungle. 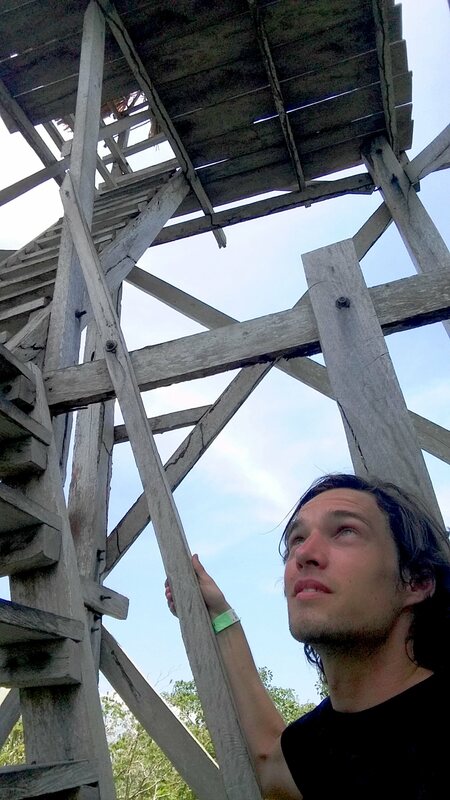 There’s also a watch tower where you could see everything from above. I really wanted to cool down in the water to survive the rest of the trip, but was disappointed to learn that you can not swim in this lagoon, only take a boat trip for more money. There’s supposedly a swimmable lagoon nearby, but I was already a little late, so I had to get going. I barely got up on the bike when I saw a roadside restaurant called “Chunyaxche“, and decided to avoid the midday sun and get something to eat. 4 tacos for 65 pesos is a little more expensive than usual, but won’t break your bank. It was time to do the main biking of the day! I put on my headphones and listened to the audio book for Stephen King’s “The Dark Tower“, and enjoyed the next 29 km of forest highway, barely seeing a single building along the way. With 44 km to go, there’s a cafe/pub called “Cafeteria La Selva” on the side of the road. It’s your last sign of civilization until you reach Felipe Carrillo Puerto, so I recommend that you take a break and enjoy a freshly made and very fruity honey melon juice for 15 pesos. At this point, I was still not tired at all and thought that this was going to be a breeze, but little did I know the horrors of being a small human on a bicycle until that same afternoon. As with my first longer distance, each 10 kilometer seemed twice as long compared to the previous 10. 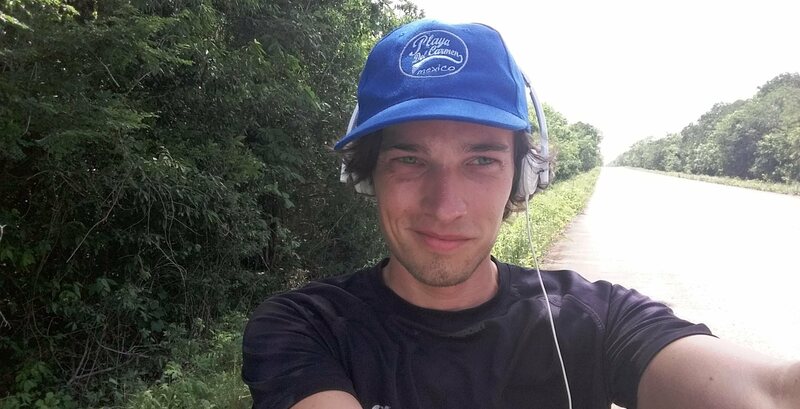 When I had almost biked 90 kilometers (plus an unplanned one hour hike in the jungle, including climbing a watch tower), I really wanted to throw in the towel! This was too much for one day, and I stopped and sat down on the side of the road. No water left, and no energy left. Would I die?! No, I wasn’t quite that melodramatic! 20 minutes later, I was up on the saddle again, and managed to ride the final kilometers of this incredibly exhausting day. “More breaks next time might be good”, I thought. In the next post, I will tell about my experience of Felipe Carrillo Puerto! The yellow building you see on the picture is a small hostel. I had booked for two nights via Airbnb.com and was happy with the price, but it turned out that they had set their Airbnb page wrong, having 2 nights still showing the price for 1. I had just come from a long and exhausting bike ride, and they kept saying I should just go and rest and we’ll deal with it tomorrow! But I didn’t want to do that, because if it turns out to be overpriced (and falsely advertised), I would want to find another hostel instead. We argued and it was frustrating, and in the end, I said we’ll deal with it later. That’s not the only complaint I have with this hostel though. The dorm room is hotter than any other room in Mexico ( I haven’t visited them all, but I can’t imagine anything warmer), and the ceiling fan does nothing to prevent me from sleeping in a puddle of my own sweat. The WiFi is the complicated type where you have to go to a website and add a username and password, and because it keeps disconnecting all the time, you have to redo it, again and again. In the end I just went to the town’s central square (plaza), where they usually have free WiFi set up. At least I could join up with an older Italian guy to buy some groceries and make some simple Italian cooking in the kitchen. Tasty and certainly the cheapest way to refill with carbs after a long intensive day! This is the town’s central square. Kind of cozy, but it’s probably the highlight of the town, except for a small museum nearby. It’s also far from the sea, so there really is no point staying here more than one night. The day after arrival, I wasn’t as grumpy anymore. I woke up feeling rested, and managed to solve the payment problem by asking Airbnb nicely if they could return my online money, so I could pay cash instead. It was decently priced, 170 pesos per night, and now I will recommend this hostel if you need a night or two to rest. I stayed only one night in this town. Perhaps not quite enough to recover fully, but I wanted to continue to a nicer place as soon as possible! 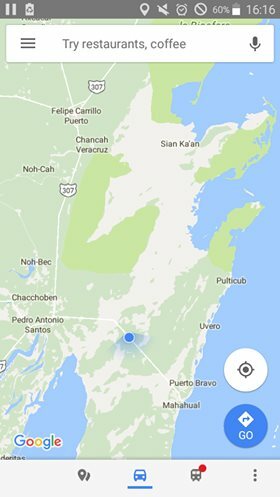 My plan had been to go straight towards Chemutal next to the Belizean border, but I was convinced to join another backpacker to take a detour to a final Mexican coastal town, called Mahahual. Since it’s off my track, I decided to cheat a little, by letting a bus take me half the way. It costed 46 pesos per person for the 60 km trip, and it was modern and air-conditioned. We got off at a tiny place called Limones (which also has ruins, but we didn’t visit them), where my friend got on a 50 peso colectivo (a smaller bus, or van), and I started biking. I realized right away that this would be very tough. The frikkin’ wind! I didn’t think about it before, but it makes a crucial difference. 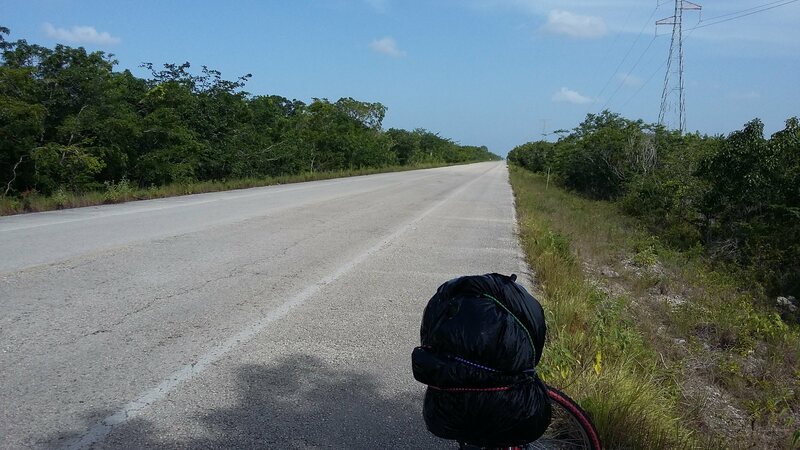 And this road goes straight east towards the Caribbean sea, with a constant warm wind working against me non-stop. Every push took twice the effort and I had to pedal on a lower gear the entire trip. Had to take a longer break after 20 km, and as if that wasn’t enough, the road got considerably worse right after. After five hundred years, I had to check my GPS, and I was still only halfway. This route was just as tiresome as the 94 km one I biked the day before, and more monotonous than ever. With 20 km left, I was once again sitting on the road, trying to muster up some final strength. At that point, I was out of water (again I had not brought enough), and I started holding out my bottle upside down whenever a car passed me, but no one was kind enough to stop. “This is what I signed up for though!” I thought. A challenge, to see what I’m made of! With 5 km left, I was finally greeted by civilization again. A gas station, where I could buy some water! After consuming 1 liter in a few seconds, the final stretch was easy, and I arrived in this beautiful little town right next to the beach! I really look forward to a future distance where I arrive not completely exhausted! That would be nice. Next update will be about Mahahual, the nicest place in Mexico I’ve visited so far!